Today's Friday Flashback takes us back to the mid 90's with the last Converse team shoe to feature the star with the chevron inside. This shoe featured the next evolution of the React Juice technology. The RAW stands for React At Work. Here is part of an article on Converse in 1995.
flow between the two units, while also maintaining its resiliency. The Hardball campaign featured commercials and print ads with Dr. J, Larry Bird, Larry Johnson, Kevin Johnson, Latrell Sprewell, Isaiah "J.R." Rider. These ads ran from July 24 through Aug. 27 of 1995. Below you can see the three react posts that make up the Accupod. I remember going to buy some shoes for school that year, 6th grade. I really wanted a pair of Reeboks that Muggsy Bogues wore. After searching around I couldn't find them. So I settled on the Converse Raw Energy. I could only find one picture of the colorway that I had, just so happens that I found them on Kobe Bryant's feet. His high school team shoes for 1995, pictured below. 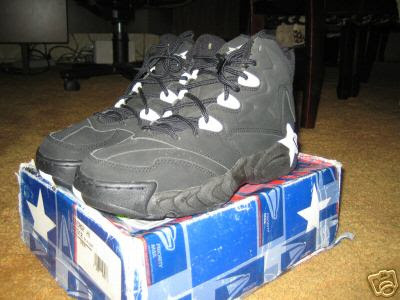 This shoe also came in high top and low top versions. Here is the black/white colorway. However these shoes and the Accupod React system was not without problems. The shoes began leaking the React Juice from the outsole. What was determined to be a manufacturing defect. Two shoes, the RAW Energy and the RAW Power had to be recalled. There were somewhere around 400,000 pairs of produced with the RAW Accupod system. It's unknown, to me, how many actually leaked or were returned. 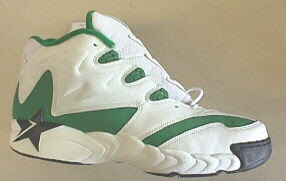 Above is the team white/green version of the shoe. This would be the beginning of the end for React Juice. 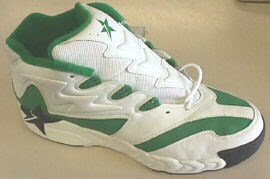 In future shoes, most notably the All Star 2000, React seemed to become more Gel like. Then eventually React II was used, it was not enclosed and was certainly a gel and not a juice. However, I will say that my pair never leaked, and I'd still be willing to sport a pair today. Thanks for reading, enjoy you're weekend. These shoes were the worst EVER made. We wore these at Kentucky for a while (I was a manager for the team), and they leaked that silicone React juice all over the court. It was a nightmare. This shoe was the downfall of the once great Converse brand. Great looking shoes pity about the dodgy accupod system. 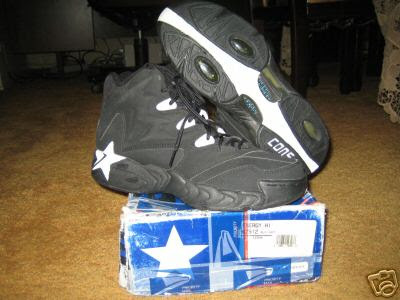 I got a pair of All Star 2000's when they were first released this pair had REACT juice in a plastic cell.The second pair i got about 18months later had more of a gel like REACT cushioning in the heel. I chopped both pairs up when they were thrashed to check it out!! !